← What Would David Say? To me, David has been VERY clear. He’s taking a break to discover his sound and voice. He doesn’t want to be with a label if it means repeating the process he went through with Jive. He’s planning for a Christmas tour. His father is on his management team. I ask, what more does he need to clear up? This quote from Desertrat captures everything I’ve felt about David Archuleta. He tweets to us on a regular basis, and when he gets a chance, he vlogs to us about what he’s been up to. In interviews, he often shares what is most important to reveal about himself and where he is at this point in his music career. So why is it that fans still have the impression that he’s not being open and communicative with us? And it never fails. There is always, ALWAYS somebody else out there, in the wings, in the corner, at home, in the band, in management, etc. who undermines David’s own attempts at sharing with his fanbase by offering various tidbits, leaks, rumors, and what have you. ALWAYS! And it’s been like this since his Idol days. The folks around David, for whatever reason, feel the need to shine through David, and they do so by inciting his fans. 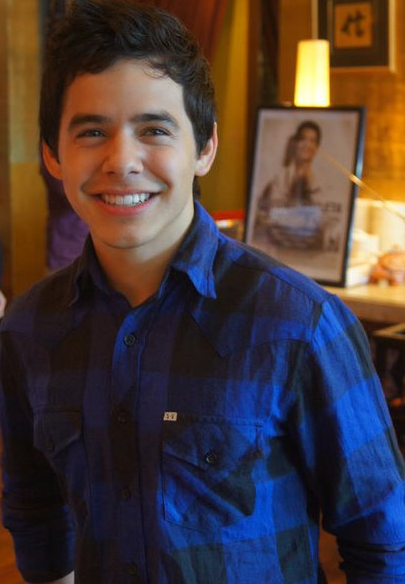 What is David going to sing on Idol the following week? Well, somebody on David’s team is glad to let us know what he’s planning and how “unfair” the show was being when David didn’t get to sing his first choice (I’m so not even going to name names here). If David mentions his pet goldfish in his very first vlog, somebody (VRS, and again, I won’t name names) just has to contact the fan sites and let everybody know she’s got the full story on that goldfish (I will always remember the full on MELTDOWN on a bunch of Idol forums that person had caused because she had some inflammatory back story about that poor little fish! All David wanted to do was answer a fan’s question about if and how many pets he had!). If David meets and greets fans, #MIC has to get chatty with the same crowd, often revealing more behind-the-scenes drama than fans need to know. If David mentions an upcoming performance, somebody in his entourage has to tweet about it and give fans more information than needed. If David parts ways with his label, somebody in his management has to get the story wrong on Twitter! So, when fans say David isn’t “communicating,” what that really means is: other people around him are revealing more information than what David himself is offering. The results of this? Fans now think we should know more than what David says. But why should we know more than what David is willing to reveal? Because other folks already revealed it for him? These folks around him “leak” his business to the fans because they obviously enjoy the attention. If there’s anything that I think David needs to do, it wouldn’t be for him to reveal more about himself. It would be to PUT A GAG ORDER on all members of his entourage! Of course, I could just tell all the fans to stop listening to anyone who isn’t David when seeking David info. But, the thing is: we’re FANS! Of course we’re hungry for any and all David news. At the same time, we do need to recognize all “VRS” and the like as the “trolls” that lurk and post on any random blog. And you know who “trolls” are: they exist to derail all communication. Posted on August 22, 2011, in fans, public image. Bookmark the permalink. 80 Comments. You said it all, HG. Very good summary of the current situation ! Love that tweet, cmoi! Free Food!! I’m gonna buy some of their cereal just because they’re offering to feed David and made me lol. David clearly stated his account was hacked and he deleted the offending tweets. That should be the end of the story, but wasn’t. You hit the nail on the head why so many fans continued to worry. It’s been so irritating to me through the years when “helpful” insiders give out “tidbits” of information. The fact that it still happens when everyone should know better infuriates me. Especially #MIC repeatedly saying things like “David would hate it if he knew I said this…” “Don’t tell David…” on the Asian tour. Um, you’re his father, why are you being so disrespectful of your son? Grow up! There, got that off my chest. Also, I don’t think we’re going to hear David address what was said by the hacker. There’s no reason to bring more attention to it, plus he could make things worse if he tried to explain anything. David has said he feels like he’s already serving a mission. If he changes his mind and decides to serve a traditional mission; he’ll announce it. No drama. The drama, as you said HG, comes from external forces. I totally agree with HG and Utahmom regarding #MIC concerns. good afternoon guys, if david want to go on a mission, that is his choice and he can do anything he want. noone cannot control that and he is a grown man to make his own decisions, not his family, friends or his fans. I agree though that the many VRS’s are a problem for a fanbase haunted all the time with the possibility of him leaving his career. I don’t think it’s possible to for David to control fan’s attitudes, anxieties, fears, etc. with regard to his career. Also, I’m not sure that it’s possible for him to actually stop his entourage from gossiping. In this day and age, it’s so easy for any and everyone to spread rumors re. celebrities. How I respond to those rumors is something only I can control. I can ignore his family, friends, crazy fans, etc,. who have loose lips. We’re all different. If D’s trying to speak to all of us re. each of our concerns, he’ll never have time to finish building his foundation. This is for the previous thread, can’t pick just one part so i reposte the all thing, because i think GG explain very well part of that feelings. Amen HG, Utahmom and Idolfan! And as for siblings who in the past may have leaked information for attention, out of jealousy, etc., it’s obvious that the apples didn’t fall far from the tree. The tree being #MIC. Good point. No wonder David is so close to his mama. Lupe is the only one who’s figured out how to be gracious to the fans and be protective of David at the same time. Well said, HG. The only part that I might not wholly agree with is how his band interacts with fans. They are building careers, too. We like them, they like the fans, there is going to be interaction on social media sites with them regardless. The answer is for David to tell his “insiders” – whether it’s #MIC, the band or management hangers-on, what is open for discussion, and what is not. I would be surprised if that happens now with any regularity. I suspect David is very trusting and doesn’t think of it, although, who knows. .
As for the continued speculation about the mission – forget about it. David has not mentioned it in years. Others keep bringing it up, but David said a few years ago that his music is his mission. I’m not going to even consider that he would leave his musical life and career until David himself says, “Bye bye”. I don’t see it happening. Listen to what David said before he sang “Be Still My Soul” at BYU last year and take THAT as gospel about a mission. We shouldn’t criticize the band members or others who are communicating about their own lives and careers. If they happen to work for or with David, they shouldn’t have to stop talking just because he keeps things a little close to the vest, unless it would violate normal professional bounds, or it’s untrue. And I absolutely agree on the mission. As I said last thread, I don’t get why people think anonymous, door to door proselytizing would even be an desire for someone who reaches so many people through his career. I can hardly stand to go door to door helping my daughter sell Girl Scout cookies for a couple of hours–and most people actually LIKE Girl Scout cookies. Two years, six days a week, bad weather, constant rejection–you have to hand it to them. I don’t think we should criticize the band, producers, etc. either, as long as they are being professional about it (and most, not all, have been). It’s part of their job. My son is serving an LDS Church mission, and although he has had a ton of amazing experiences, it can be tough at times. He has served so many people and helped dozens of them on their journey to baptism, but he still could never touch the hearts of anywhere near as many as David has and could still through music. Logistically, it’s a no-brainer. Emotionally, though, it can be difficult to forego a traditional mission, because it can be an incredible experience for a missionary. It really can be a sacrifice for some young men to not serve a traditional mission. Donny Osmond went so far as to turn in his papers, but was denied (obviously). I can see that David might feel some regrets for the personal growth he would miss, but he can also see the opportunity for greater good. if david does go on a mission for 2yr in jan, of course his fans wont like it but his fans have to expect that and be happy for him, you know? again, if david does go, i think he will be come back with music better than ever!!. still no from tweets david yet, i hope he okay and hope the hacking didn’t get him really upset that bad, i think it did? Idolfan: Why do you keep repeating that? It’s already been stated that was a hacker. well okay. i wont say the word anymore now. what i am saying is i hope david is not really upset what happened to him on twitter and why he hadnt not tweeting yet and i think it is part of it. if david does go on a mission, i guess that means there will be no chirstmas tour this year and thoses two event in japan and AZ might be cancelled???. well okay than david just tweets, i guess he is fine now, that good news. You must have some pretty long, froggy legs to make that leap. wow, sound you guys here don’t like me posting here, well i guess i wont be back here anymore. well goodbye than. you said that so many times and u keep on coming back…well at least do as you say…also, at least make your post credible. if EVER david goes on a mission, he can do it before he turns 25, not right away..
Oh Idolfan, it’s not about not liking your posts but just wondering how you get stuck on certain rumors, even when they’ve been debunked! You know why most of us are not worrying about David going on a mission in January? Because he deleted those tweets and said some “Fake David” was pretending to be him. Between David saying that was not him and David deleting those tweets, there’s only one conclusion to draw: the information is NOT TRUE! I already told you about learning how to tell what’s real and what’s not on the Internet, young lady. gina, i will be here for a while but i wont be coming back here after that. He never misses a self-promotion opportunity. So, w ho is this guy, and why should I care? And if this isn’t proving the point of my post, I don’t know what is. I remember from the olden days when MIC met RP in a Best Buy? or some store because he was a piano rep and MIC was looking for arrangements for David to sing at a corporate Christmas event and RP then worked up the arrangement of Silent Night and some of the other songs and then accompanied him on piano at many events. Richard is the founder of FOD, and a family friend. And he arranged a song or two on CFTH. He also spilled lots of info and jumped into the fray often on the idol forums. Oh, maybe HG was just being sarcastic here? In that case, ignore me. Dang, sorry. I didn’t mean to hurt your feelings. Please don’t go. that okay. alright i will come back here but only for a while. hellogoregeous, like i have said before rumors were not coming from me, i get this from the twitters, DA fansites, like you said. in my personal opinion, i really dont think david is gonna on the LDS mission, i think he is still sticking with music and of course with his awesome fans in the world!!!!!. Right, VJ. Actually RP did step up to the plate when that original fansite had major “difficulties” or “issues” so RP and Becky and Jenny and some others started FOD. hmm…..david and charice twetting at the same time again and david didnt go to the adele concert last nite in SLC, that a shocked because he loves her music, i wonder if david is hanging out with charice in vegas!? i am only guessing okay. charice arrived in vegas last nite, that is not a rumor just wanted to add that part. I tweeted at the same time as David more than once. I wonder what that means … That David was hanging out with me or that it was a pure hazard ? “Logician: The cat has four paws. Isidore and Fricot both have four paws. Therefore Isidore and Fricot are cats. Old Gentleman:My dog has got four paws. Also, as Raelovingangels said, it’s not personal when someone disagrees with you. It’s a public site where “anonymous” share their opinions and others react to them (positively or not). You shouldn’t feel the need to leave this place every time another poster disagrees with you. Idolfan you are more a troll than I am. since u’r only guessing and speculating, why don’t u just keep it to yourself? and also, stop saying “goodbye for good” coz u clearly couldn’t get yourself away from this site. if anyone bash at me just in case, two words i didnt post “dating’ or ” girlfriend”, like i said before that i am only guessing that all, people need to relax. if you all going be mean to me just over a “guessing comment” than i wont come back. I like the posters at IDF because they are not afraid to say what they think. TBH, I don’t know if they’ll have the patience for the “David and Charice tweeted at the same time so that means that they are together” kind of comments lol. Of course, I’m not trying to dissuade Idolfan to post there (or at any other place). my final comments on this souldavid,i have something to say here, some of you guys have been really nice to me and thank you for that. and some werent too nice to me, i don’t have nothing to say.. GOODBYE! Idol fan- I don’t think anyone is trying to run you off- but it is a give and take. When you say something- someone else has a right to respond and agree, disagree or point out how speculative you are being. Nothing personal! This is my 2 cents. I think you make many strong points. I don’t think a gag order is the answer however, or is it realistic. I think that David is in a business and part of a business is customer service and communication. Unfortunately however not everyone gets to personally meet wiith the CEO. The team must be trained. They must have a good understanding of what is appropriate to communicat abd w and what is not. They must represent David’s point of view to the fans/customers/business partners. So, I think the issue is commuication and boudaries. Everyone having a good understanding on the general talking points. I would not expect a 20 year old to realize that. I was disappointed with WEG and how Mel steamrolled over David. Would have thought professionals would work that out with their client. But I gotta think there are professionals out there who can do that. If not David will have gto hearn the hard way- and it may take a few years for her to realize noy only is he in charge of his music and career- he is in charge of how those around him communicate about him- and it is up to him to take leadership on that also. I do agree his direct communcation with his fans is pretty amazing. oh, and thank heavens I have no clue about the “goldfish” drama…. I did not go on line looking at DA until after Idol was over and I was in withdrawal for my weekly fix. lol never thought I would end up 3 years later wondering about a mission, winter tour, hacking of twitter- Good grief it is like pulling a thread and the hem comes out. Have learned alot about the music biz however, new artists, re-discovered music, and improved my technology skiills. So true – I had no idea about blogs or anything. I just went looking for a youtube (had just discovered youtube) and found all of David’s old ones – one of my favorites is the 8th grade talent show one:http://www.youtube.com/watch?v=AdjGDb1aWXY . I remember most of his Idol youtubes had millions of views before most of them were pulled. Remember that Imagine had more than 1million views right after he sang it and all the multi-million youtubes have been pulled of it. Same with his finale videos. Like some of you, I didn’t discover the blogs either until after Idol was over. Below is a link to a story where TG (Toxic Glitter) shared some info re. Conditioner, etc. You can see the bitter response from someone else immediately following it. Talk about living in a fish bowl? I love the video you posted Collegemom, so young and already so talented ! The “Gag Order” line was me being very sarcastic. Can you imagine poor David trying to put a muzzle on someone like MIC? 🙂 Yep, I hear ya. So marching orders to all. Which is one reason I have concerns about family management- ( as has been voiced here before). It is complicated. I mean what do you do- give them a memo? write them up? sorry now I am being sarcastic. I do think that this is what David wants right now- so I gotta respect that on some level he knows what is right at this time. Some fans already received their MoTab DVD. I haven’t ordered it yet but there are a lot of positive comments about it. When David answered a fan’s question in his very first vlog – “do you have any pets?” – among the different pets he mentioned was a goldfish called Conditioner. Well, some VRS (forgetting her screen name she used to go under) revealed to fans that she had the “inside scoop” on Conditioner, and then told folks that there was some other goldfish called Shampoo (I think that’s what was said? I’m forgetting alot of the details!). Either way, the story went that this goldfish died in the bathtub, I think? And David was to blame, I think? Or was it that, after the fish was in the bathtub David tried to wash him with conditioner? Whatever! Somehow, in this retelling, some fans objected to all this “back story”: TMI is what some folks called it. Then there was back and forth and then some folks got their feelings hurt, and then there was a huge explosion. That’s it. The end. I think (anyone with a longer memory, please correct me if I’m wrong!). I knew I was wading into quicksand territory when I belonged to a fanbase that would argue over David’s pet goldfish! Ha ha, thx for the story! It seems like not that much has changed. Yep, I too looked for more about David after Idol was over and found David fan-sites, you tube videos, newspaper articles, etc. I had to get my David “fix” too. I think that’s why whenever the subject of a possible two year mission for David comes up we (David’s ODD fans) panic. David has been our entertainment. If David does choose to go on a mission maybe I’ll read more books again. Wow, I was thinking the same sort of thing. It would probably be a very good thing for me personally if he went away! HG, coming out of lurkdom to say… ‘I couldn’t agree more’ about David communicating with the fans. The rest of your post…I either can’t comment on because I didn’t know about David at that stage or I’m not sure where I stand on the issue. I think people just let worry get the better of them which causes them to lose their perspective. All they can hear is all the ‘noise’ of everyone’s worry and then they begin to think David has changed his mind. I have said it here before and I’ll say it again….if a rumour is repeated enough, people begin to believe it. Worrying over issues has the same effect. Btw, still have huge issues with this comment box…the twitter and facebook buttons and the screenname/email boxes keep covering the comments box and it’s hard to see what I’m typing. Thanks for coming out of lurkdom, Shanny! 🙂 What twitter and facebook buttons? We can’t stop people from worrying and we can’t tell them how to feel or how it’s correct to feel. This fan base is really diverse not only in age, gender, religion, culture (etc) but is also composed of different personalities. There are worriers just like there are extreme optimists. There isn’t a guide of the supposed perfect fan (or I’m not aware of it). I’m a fan of David since AI (the time flies so fast !) and I often feel like if I don’t follow the “authorized way of thinking” that means that I’m not a good fan. If I make a negative judgment, I’m not a supporter but a naysayer or at best a doubter. I feel like there’s a fan created hierarchy (if you post in this particular fan site you’re an A+ fan, if you think that D’s an angel you’re an A+ fan but if you dare to think that there’s some issues in D’s career you’re a D– fan. Of course, I’m exaggerating but just a little lol. We should have a test like in those psychological magazines to determine what kind of fan we are lol). when it’s hard to see what I’m typing, I just click the “enter” button several times so there’s more space between the comment box and the facebook and twitter buttons. I hope it will help you (sorry for my bad English !). Pardon my barging in, but… Clap! Clap! Clap! Clap! Thank you HelloGorgeous, and now that I’m up giving you a standing O, let me shout out a couple of things also. David has communicated with his fans so much and has given us a very intimate look into his life, by so honestly sharing what he believes to be important. Not many celebs will let you get that deep into their (real) heart. As far as his career, he tells us over and over again in interviews, that music is his passion and his goal is to always do music. He has explained how he hopes to use his music to help people. As far as what steps he plans to take in following his passion and reaching his goal… why should he be obligated to inform his fans of those details? Maybe he thinks the steps may change along the way, but the goal will remain. I’m trying to learn to just go with the flow. If David wants to tweet about his favorite foods, or a quote that impresses him, or explain his long term goals in an interview without saying his exact plan, then that’s good-a-damn-nuff for me! As far as the personal conversation he has with his Bishop (and God) about his religious choices… that is NOT something that I should know. 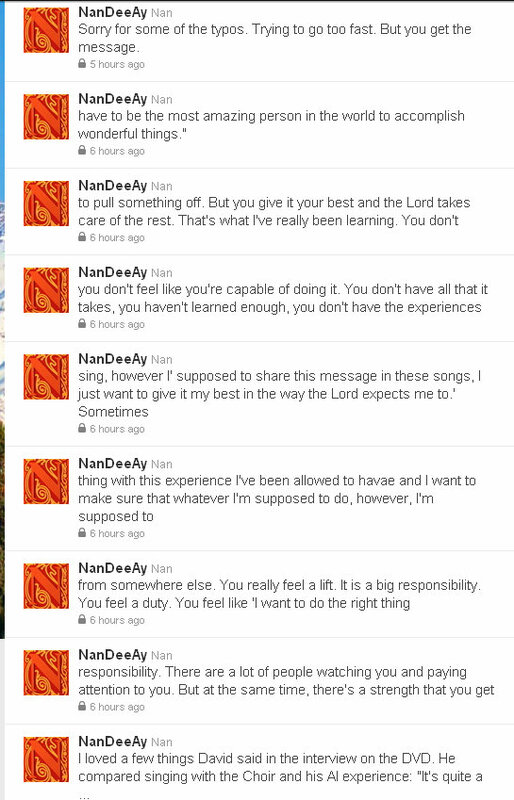 I don’t feel he needs to give “clarity” or announce anything! I think we all understand the connection David has with the song Everybody Wants to Rule The World. It may surprise us all who he is including in the “Everybody”.